distribution Essentially only the Sandhills region, plus the adjacent southern Coastal Plain, east to Harnett, Cumberland, and Bladen counties. NC lies at the northeastern edge of the species' range. The species has one of the more limited ranges for a dragonfly -- primarily along the Fall Line sandhills from NC, through central SC, to extreme eastern GA.
abundance Uncommon to locally fairly common in the Sandhills, but very rare to the east. Can occur in some numbers, as there are three daily counts of 15 or more individuals. flight Spring season only; early April to late May. habitat Sunny margins of lakes, ponds, pools, and other slow-moving water, often around sphagnum moss or other "boggy" ground. behavior Adults perch on the ground in the boggy places or dirt/ground nearby. They probably do not stray too far from such wet areas. comments In the Sandhills, this species is not too difficult to find, if one walks along the boggy, open margins of beaver ponds or man-made ponds, especially looking near sphagnum moss. Wet spots in powerline clearings can also have the species. 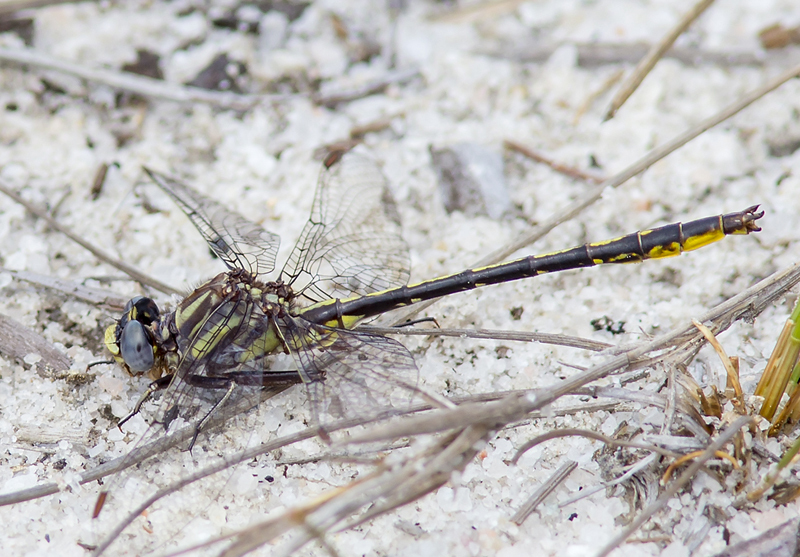 It is one of the smaller clubtails, appearing similar at a glance to the much more common Lancet Clubtail, but the Diminutive (as the common name implies) is even slimmer and slightly shorter than the Lancet. A previous photo from Brunswick County that was identified as this species has been confirmed by the website editors (in late 2016) as a different species and thus this county has been removed from the range map. Comment: Scotland, 2017-05-15, Scotland Lake, Sandhills Game Land. Male preying upon a teneral Variable Dancer. Comment: Scotland, 2016-04-23, Sandhills Game Land, Scotland Lake. Mostly males. Photo.